GDPR has now come into effect. 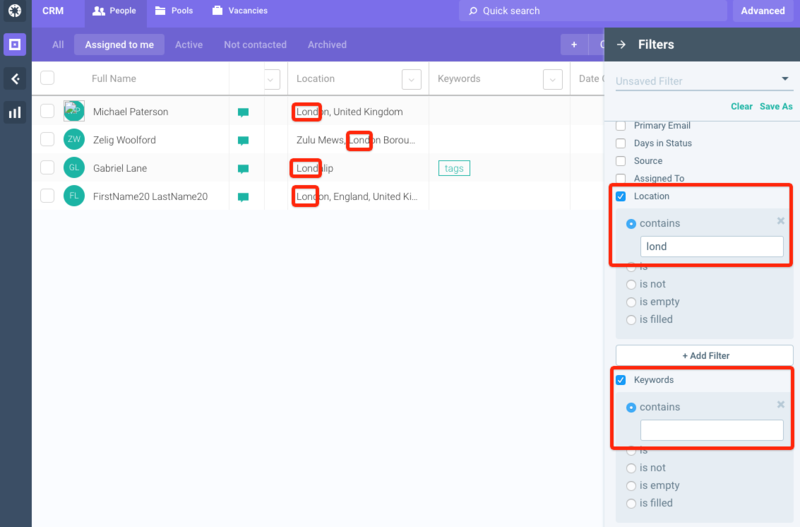 Following the Consent Management feature release earlier this month comes our Manual Anonymization feature, enabling customers to anonymize contacts who have expressed their right to be forgotten. Anonymization works like deletion, except we'll hide rather than delete the contact's name, email and social URLs so that we can identify, flag and block a previously anonymized contact from being accidentally added back into the database. Super Admins, Admins and Team Members can anonymize contacts from their full profile via a two-step process to reduce the risk of accidental anonymization. Anonymization is only possible for Archived contacts and the user must archive the contact before taking this step. They will receive a warning to confirm if that step has been taken when they attempt to anonymize a contact. Super Admins can manually un-anonymize contacts from a candidate's profile by selecting the three-dot dropdown menu at the top right. This should only happen if a candidate has opted back in to receiving communications from you. If a user (who isn't a Super Admin) needs to un-anonymize a contact (having received the contact’s request), they can ask the candidate to sign up via a form, or they can share the contact’s full profile URL with a Super Admin. Once an anonymized contact has been un-anonymized (or they opt back in via a form), the contact will re-appear as a standard profile with their name, email and social URLs. You will also see an activity card in their full profile indicating when the contact had been previously anonymized for full context. 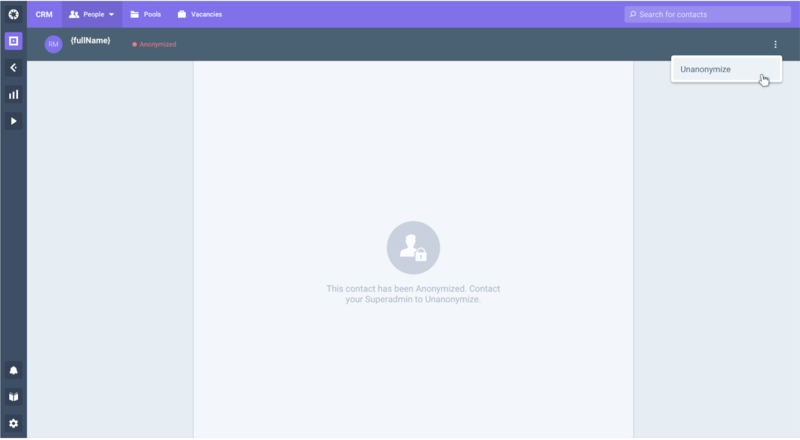 If someone on your team tries to manually add an anonymized contact into Beamery, they will be redirected to the anonymized full profile and subsequently prevented from being able to re-create an anonymized contact. ‘Contains’ filters - to enable better identification when filtering ‘Location’ and ‘Keywords’. This means you can filter candidates based on a partial text search. For example, you can enter part of a location or part of a keyword to search for candidates in your CRM. Search results appear immediately as soon as you start typing. Beamery 4.0 allows you to refine your search per location. As with filters, this is based on partial text search. Beamery 4.0 enables a ‘bulk action’ to be applied to a group of candidates in Advanced Search. This allows users to assign all candidates that appear in an Advanced Search result to a pool or vacancy, or to apply a tag in one single action. Beamery Advanced Search already supports a variety of post-search actions such as adding a candidate to a vacancy, a pool, a campaign, or more. However prior to this update, this was only possible for one candidate at a time. Expanding this to enable bulk actions has been one of our most frequently requested features and we hope this can make a significant impact to the workflows of all Sourcers starting a new search. The Messaging Leaderboard in the Campaigns Report showed open rates and reply rates, along with the change in this rate during a specified time period. Customers wanted to see the actual figures for opens and replies along with the open and reply rates, instead of only seeing the rate of change within the specified time period. They also wanted to see the click rate alongside the number of clicks. Our update to the Messaging Leaderboard will now show this. We've also included a new column called 'Messages Delivered'. While 'Messages Sent' displays the total number of emails sent out, Messages Delivered displays only those emails that were received by the candidate (i.e this excludes emails that bounced or were undelivered, for example due to an invalid email address). Open, click and reply rates are calculated based on the number of messages delivered (which you can see in the example below). 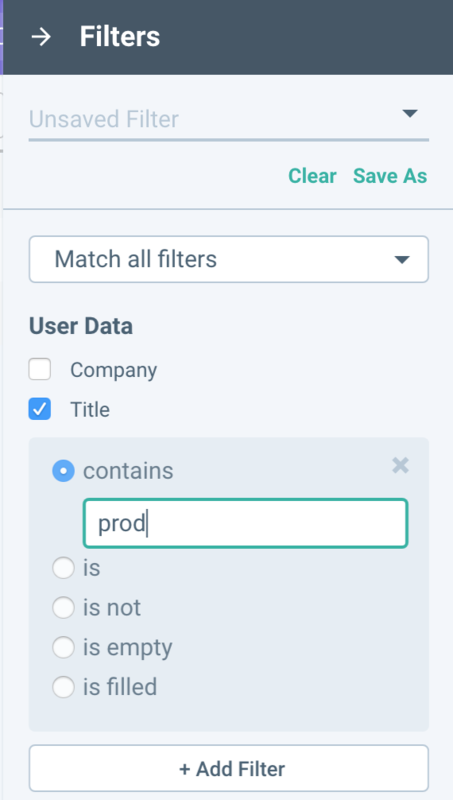 ‘Contains’ filters - to enable better identification when filtering 'Title' and 'Company', with ‘Location’ and ‘Keywords’ to follow. This means you can filter candidates based on a partial text search. For example, you can enter part of a job title or part of a company name to search for candidates in your CRM. Search results appear immediately as soon as you start typing. Default Filters - organisations can now set a default filter, which can be used to automatically exclude certain contacts ‘by default’ within any view within the CRM. For example, you can exclude ‘rejected candidates’ or contacts in a certain status from appearing, until the default filter is removed. Beamery 4.0 enables a ‘bulk action’ to be applied following any boolean search. This allows users to take all the candidates resulting from an advanced search, and assign them all, in one single action, to a pool or to a vacancy, or to apply a tag. Sourcing typically starts with searching. 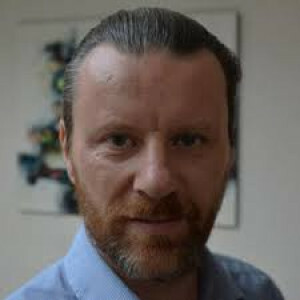 Being the start of the process also implies that sourcers will throw a wide net, and include many contacts in their subsequent actions. Beamery Advanced Search currently supports a lot of post-search actions such as adding a candidate, one at a time, to a vacancy, a pool, a campaign, or more. Expanding this to enable bulk actions has been one of our most frequently requested features, and we hope this can make a significant impact on the workflow of all sourcers starting a new search. Beamery 4.0 delivers a completely redesigned email digest. Rebuilt around the needs of sourcers and marketers, it provides a daily, or weekly, overview of everything noteworthy that happened during the previous time period. Beamery 4.0 sees a series of new recipe actions allowing for improved candidate data management in your CRM. Archive - You can now automate candidate archiving when certain triggers are satisfied. For example, if a candidate unsubscribes from a campaign or upon a particular status update, candidates can now be removed from the core CRM and moved into the Archive area of the People grid. Candidates can always be 'un-archived' and moved back into the core CRM at any time. Do Not Contact - Users can now mark candidates as 'Do Not Contact' with a recipe. 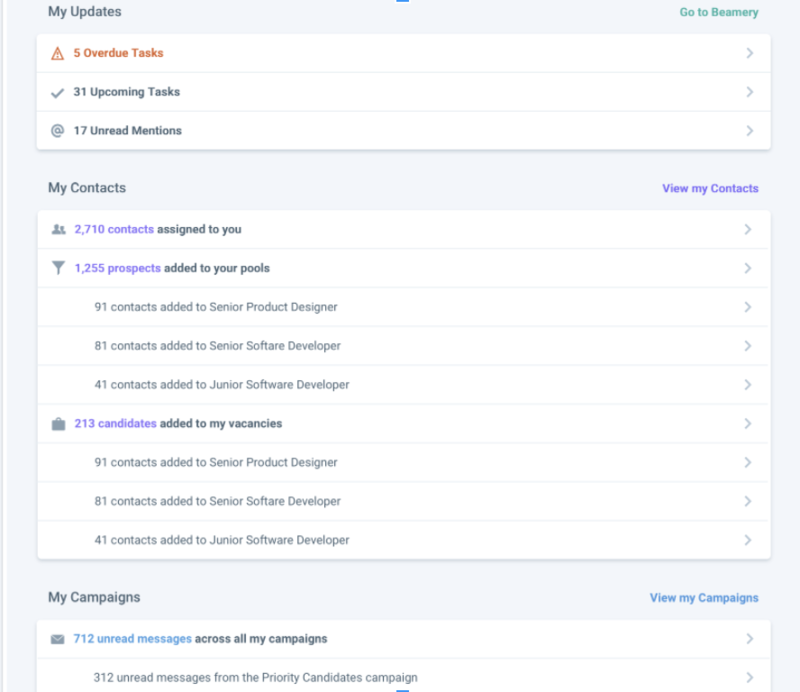 For example, you can create a recipe to mark candidates as 'Do Not Contact' upon a particular status update, or if they unsubscribe from a campaign. Marking a candidate as 'Do Not Contact' means they cannot be added to any campaign in Beamery. You can see from a candidate's profile if they have been marked as 'Do Not Contact'. You can remove this from a candidate's profile at any time so they can be re-added to campaigns. Assign to source - You can now automatically assign a source to a candidate who is added into Beamery. This is particularly useful for candidates added through the Extension, for example, as you can assign a particular network or platform (e.g. LinkedIn, GitHub) as their source. This information feeds into the analytics reporting engine to provide insights into the most effective sources for candidates in your team.